"Christmas festivities left us with a ton of panettone and in need of some new ways to eat it. 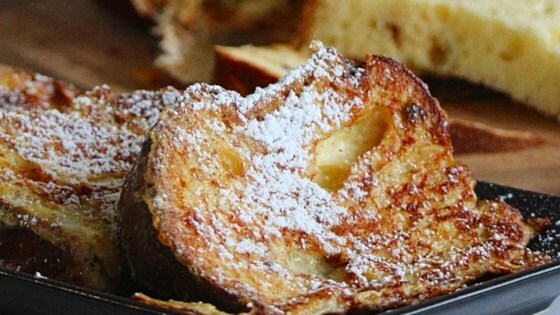 My grandpa requested French toast, so here is a new holiday twist on a delicious breakfast classic. Feel free to cut your panettone smaller before cooking if it is hard to manipulate. Serve warm with maple syrup, whipped cream, or any other topping." Whisk milk, egg, and cinnamon together in a shallow bowl. Dip panettone slice in the milk mixture; turn to ensure both sides are coated and most of the liquid has been absorbed. Melt butter in a nonstick skillet over medium-low heat. Cook panettone in the hot butter until golden brown, about 5 minutes per side. Simple, and very very good. A great use for all that Christmas Panettone.